I have been rather busy this last week that I overlooked my post here that should have been up yesterday! So, I am posting today but hope you also stop by the YNS Blog to see the other awesome creations the DT have done. This months dare is all about "What's up?" Just a creation that could be anything from a pick me up to a happy whatever. For my card, I am using the new Whatnot Sentiments Twelve to create this birthday card. I used some of the new Geometrics paper (love it!) from YNS for the background and created a bit of an envelope look for the main image area. I ran along the edge some cotton lace ribbon before I stamped the sentiment in the YNS Olive Green ink and added the included heart in some Memento Morocco ink. The Starburst Trio die set was used for creating a little visual at the corner as I popped them up. The card was finished with some of the new Carrot Cake Gumdrops. This new color combo in the Geometrics paper collection is becoming a favorite and I am sure I will be using this quite a bit. 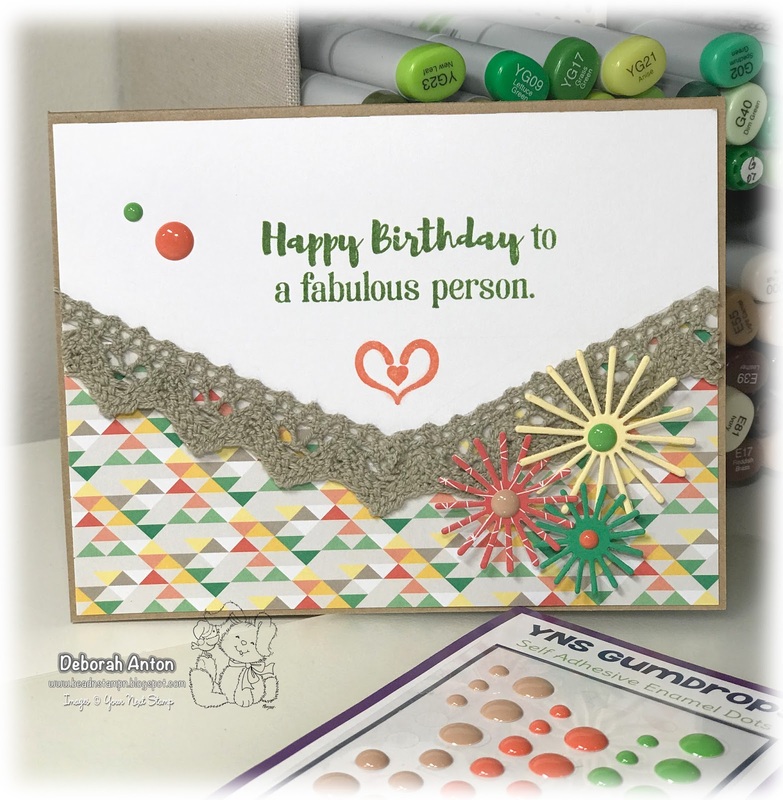 Thanks for stopping by to take a peek and don't forget to head over to the YNS Blog to leave a little love so that you can have a chance at winning a stamp set of your choice!